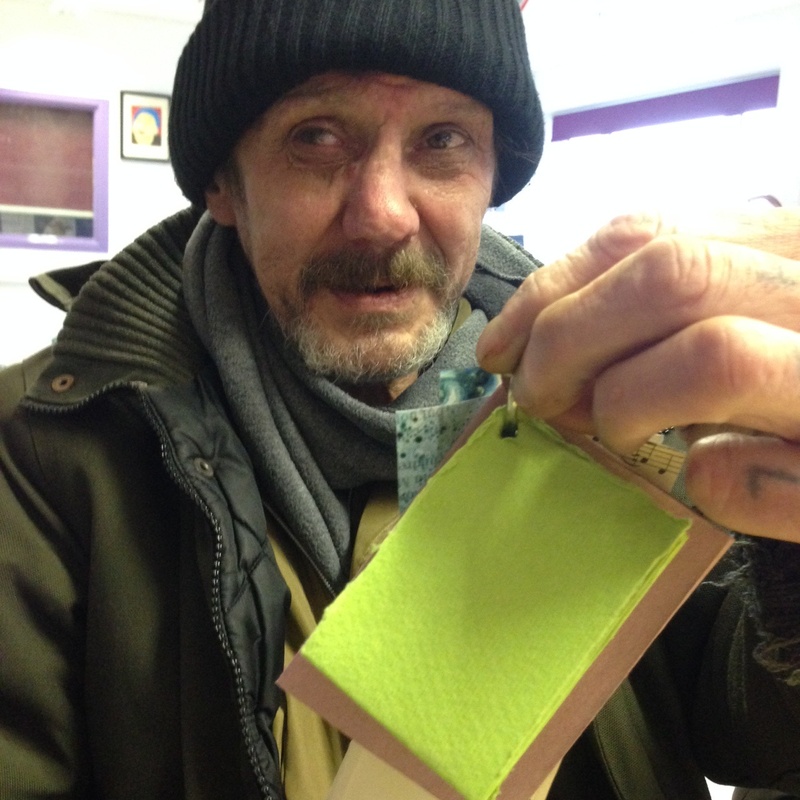 Today while working on 'The Homeless Library' at the Booth Centre, Manchester I met Phil. Phil is currently homeless, in and out of night shelters, waiting since last Spring to be housed. Last night Phil slept rough after a relentless train of events led to him missing his place in the shelter. With sleepy eyes and head, he still managed to engage with us thoughtfully and creatively - even after a night of solid no-sleep. Perhaps that's one of the biggest joys joys of art making, it takes you out of yourself - and for an hour or two you enter a different real. There's a lot of talk about loneliness among our older generations and the impact it can have on peoples health and wellbeing- but it's something that can hit any of us at any age and for Phil loneliness contributed to homelessness. 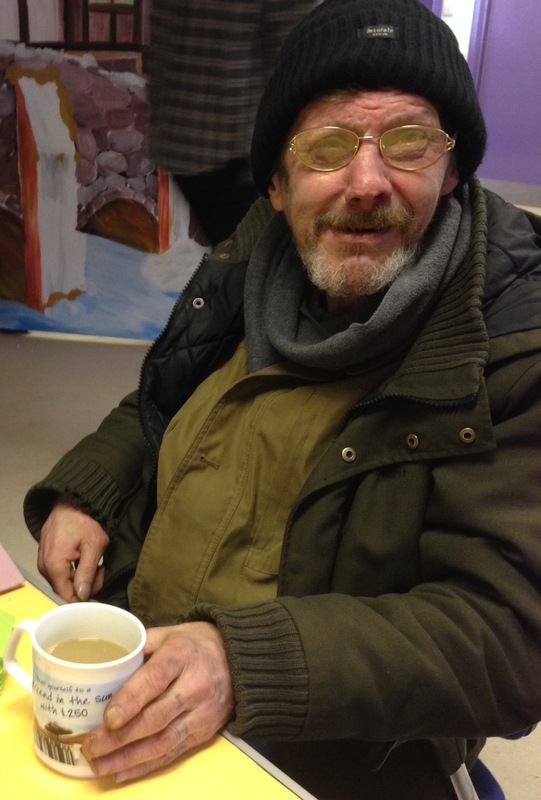 'I were happy having a flat, cosy and warm but not having anyone to talk to…. (Rough sleeping?) ‘This time its been since December 10th last year. At the moment we’re sleeping in Churches and chapels, all done through the Church and The Booth Centre. (* The Greater Manchester Winter Night Shelter) Sleeping inside the church- I’m a Methodist, I hadn’t been into a chapel since I was a kid. Everyday it’s a different place, think they’ve just started it recently. The Booth Centre knows before we go out. Last night would have been in a foyer of a church, another place a room- all with campbeds, better than a mattress on the floor. There might be 9 people sleeping there, varies. Its good of them to do it, they open at 6.30, earlier than the other shelters and you get a warm meal at night. The other shelters, there’s the night shelters at Hulme Library that opens at 8.45 or 9.15. In Harper Hey, that opens 8- 8.30 at the latest, as far as I know they are run by the council. You get toast and a warm drink and cold food, but with the Church you get a hot meal- very considerate of them to do it. The rucksack I’ve got now was given to me by one of the vicars. I leave the shelters, then come here, then me and Wally go to the library- I’ll probably fall asleep there- I missed my bus stop last night and missed the shelter last night, had to sleep rough- didn’t sleep. 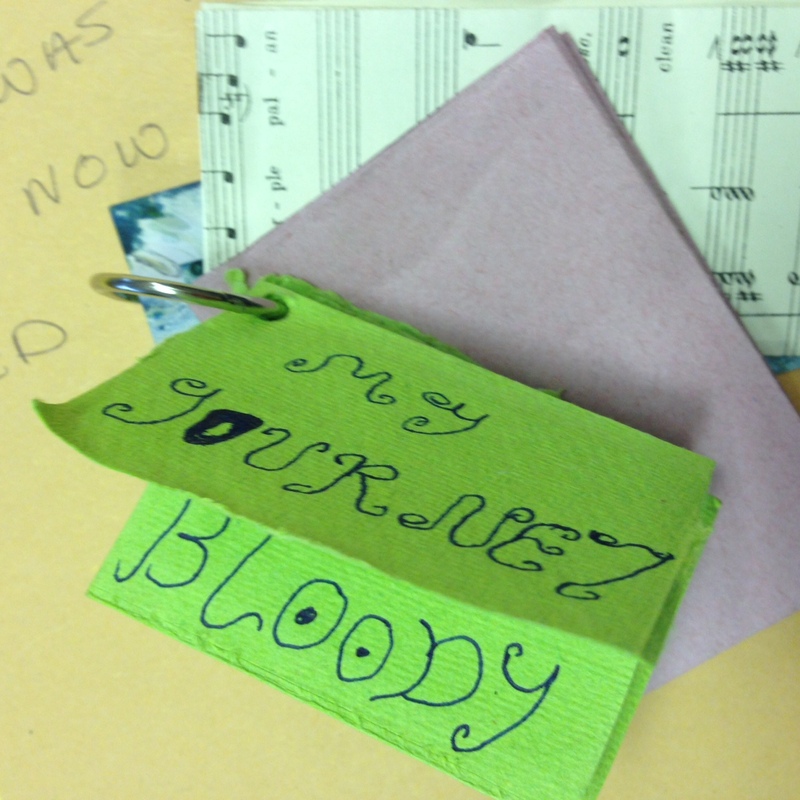 'My Journey, Bloody' artist book made by Phil. Up to last night I haven’t slept rough, not this time, but in the 80s spent two years sleeping on the streets in Lancaster, back of the town hall on a bench. In them days there were more chance of getting into a B&B or into a flat, there were more of them. Now there’s nothing. Where are all these council places they’re meant to be building? You look around and there are empty buildings, empty factories, they could be turned into places to live. When I was younger I had a decent life, I travelled in Germany, Belgium- my dad was serving in the Signals, in the army. Got to take each day as you can. I had my own flat in Oldham for 9 months, but nobody was talking, none of the neighbours, everyone was unfriendly. So I gave it up, I went back to me mothers where I was brought up. What (personal possessions) I have is at my mothers, my City and Guilds Certificate for welding. There’s not a lot of that trade, not much knocking out of doors now, cheaper to replace them with new. I’ve got 3 homeless applications in 3 different councils, and still nothing from any of them. Kirklees I put that one in half way through last year, Bradford put in the spring of last year, Preston put in 4 and a half months ago and still nothing- applying for a house so not on the streets as you can see.